Chefchaouen, in Morocco, is known for its unique blue hues. The Moroccan city of Chefchaouen, also known as Chaouen, is the main town of the province of Chefchaouen. It was founded in 1471 when a small fortress was established in the northern region of Morocco to fight invasions of the Portuguese. The city has a population of about 42,786 inhabitants. It is widely known as the Blue Pearl, owing to its buildings which are painted various shades of blue. 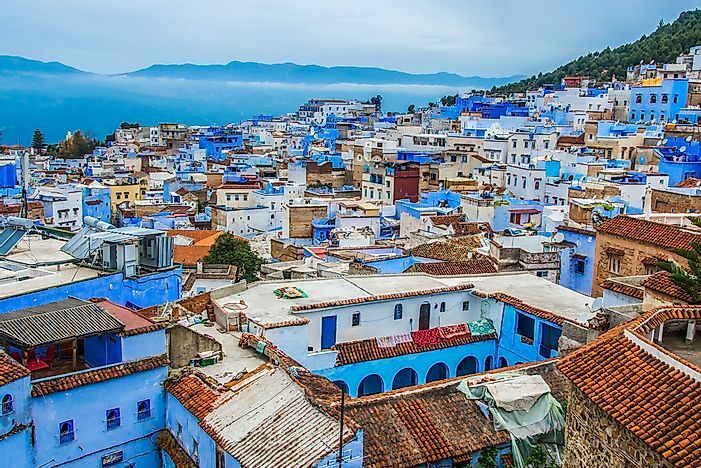 Chefchaouen was originally inhabited by the Ghomara people and following the Spanish Reconquista, many Jews and Moriscos settled in the area. The city was seized by the Spanish in 1920 to constitute Spanish Morocco. It was returned to Morocco in 1956 when the country attained its independence. Since then it has grown in popularity as a tourist destination. Its closeness to Cueta and Tangier also boosts tourism in the city. The blue colour of the buildings in the city is explained by various theories. It is said that Jewish people who took refuge in the city as they fled Hitler in 1930s introduced the colour. Some people say that the buildings are painted blue to keep off mosquitoes. Many people also believe that the colour represents the heaven and sky and serves to remind the locals to lead spiritual lives. Chefchaouen is a tourist hub due to its unique ambience and the surrounding Rif Mountains which give it a scenic appearance. It is very popular among tourists. Chefchaouen has about two hundred hotels to cater to its summer visitors, who mostly come from Europe. The hotels offer a variety of local cuisine to the guests. One of the most sought after local dishes is goat cheese. Besides the hotels, the town has other attractions such as a theatre at the Iglesia and the fortress from which the city grew. Chefchaouen is a shopping hub for tourists. The shops in the town stock various native handicrafts which cannot be bought in any other parts of Morocco. Hand woven Riffi blankets in stripes of blue, red and white as well as silk blankets are sold in various shops. Woollen garments, jewellery, carpets, lamps and lanterns, trinkets, spices and oils can also be bought in malls or shops. The shops also stock trendy legwarmers which are mostly purchased during colder months.